Nobody wants alien frequencies conflicting with their electronic devices, signals get crossed and radios start acting weird. To stop this, you need some shielding. 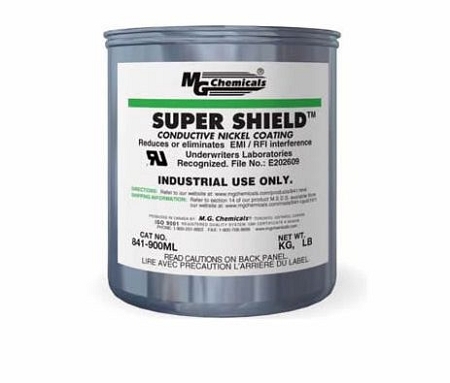 MG Chemicals Super Shield Conductive Coating blocks electromagnetic interference's and adheres to most plastic surfaces. Available in aerosol or liquid, you can just apply it to a multitude of electronics and in 10 minutes, its dry and set to work. Additionally, this shield coating is environmentally friendly and wont hurt the ozone. Tested under IEEE Std. 299-1997 conditions, you know you'll be getting an effective product when you buy MGC Super Shield. It's perfect for using on airplane control boards, aerospace technology, and any other equipment that relies on radio signals for transmitting information. Applying a 1-2 mm layer of this conductive coating will provide you with 40-50dB protection across a frequency of 5-1800MHz. 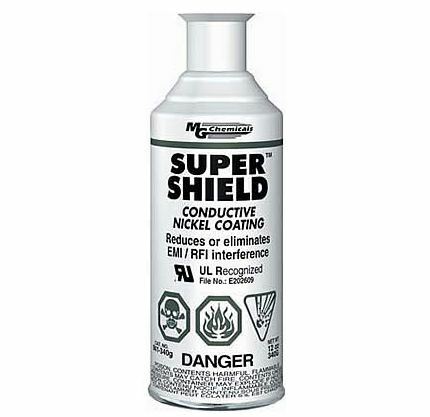 MGC Coating Thinner is a great accessory for this Shield product if you find that it is too thick for your project needs. Stability Stable at normal temperatures and pressures. Personal Protection Wear appropriate protective eyeglasses or chemical safety goggles. Wear appropriate protective clothing to precedence skin contact. Use a NIOSH approved respirator when adequate ventilation is not available. General Information Will burn if involved in a fire. Containers may explode in the heat of a fire. Flash back along vapor trail is possible. Personal Protection Wear appropriate protective eyeglasses or safety goggles. Wear appropriate protective clothing to prevent skin contact. Wear a NIOSH approved respirator if adequate ventilation isn't available. General Information Will burn if involved in a fire. Flash back along vapor trail is possible. Eyes Liquid in contact with eyes may cause permanent eye damage.